Indexed under both, Artsieladie and Creative-Endeavors_By-Artsieladie. enough the point being made and so, no one can say I haven't made my point and there is then, no excuse for stealing my work. The information this wiki-page provides nullifies any and all excuses made up to try and justify stealing my work. Note: "Free to use" is NOT the same as or equivalent to, "public domain". stipulations and the copyright ownership is rescinded. 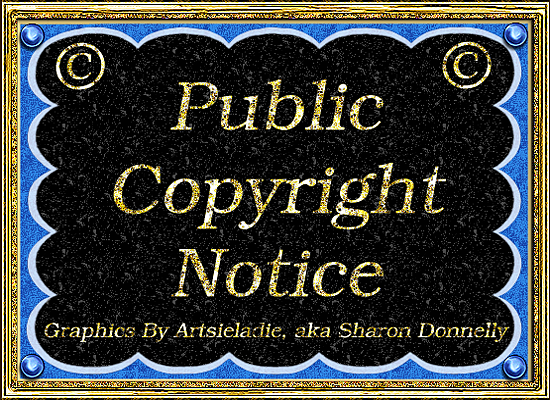 In regards to my creative works: "I" have never placed ANY of my works in "public domain" nor do I plan to in the future. So, if ANY of my works are classified as such anywhere, it's incorrect, not true. Unless modified ONLY by Artsieladie/Sharon Donnelly, aka [Faith.Hope.Love], copyright owner. graphics made by yours truly, Artsieladie/Sharon Donnelly, uploaded to this site, with/without transparent backgrounds. should history repeat itself with this site as was done to me on www.elftown.com . Note: I can be contacted on my blogspot blogs using my "contact me" page. Text ONLY emails! NO attachments! NO hyper-links or urls of questionable origin. Non-compliance means deletion of your email! ~ Someone just takes my creativity and modifies it or not and then claims it as their own. ~ ...or anything else along these lines. permission 'per use', 'per person' to use and ONLY as has been stipulated and agreed upon between the user and myself. never allow a deceptive person to use my work again. "Burn me once, shame on you; burn me twice, shame on me!" Therefore, if I'm deceived, there will be NO additional chance to deceive me again. Elfpack members to use on Elfpack ONLY" and "as is"! will then never give you permission. respect and follow anything I request in regards to my work, either. use. This I'm saying straight out because I do NOT deal with dishonest, disrespectful, and greedy people. aka [Faith.Hope.Love], unless otherwise specified. All rights reserved. - You can enjoy using Pseudo HTML colours in your house!